Science Fiction = "Yes We Can!" 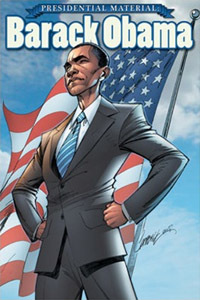 GeekBoy November 5, 2008 November 5, 2008 Comments Off on Science Fiction = "Yes We Can!" Okay, so this isn’t really a political blog, it’s a sci-fi blog. And I’m not interested in arguing issues with anybody right now. But it occurred to me last night that part of what appeals to me about science fiction is seeing realized, even if only on paper or on a movie or TV screen, amazing things that I might never hope to see in my lifetime. And that it’s silly to ever say never. A century ago, the Wright brothers had just figured out how to get a rickety one-man plane off the ground. The notion that millions of people each year might fly across the world every day in huge metal tubes … or that an airplane might fly faster than the speed of sound … or that something like an airplane might actually leave the Earth’s atmosphere and carry a man to the surface of the moon … these were pretty much considered ludicrous — the realm of science fiction. We’ve all seen black Presidents, of course. In 1997, Tiny Lister played President Lindberg in The Fifth Element. In 1998, Morgan Freeman played President Tom Beck in Deep Impact. And more recently, Dennis Haysbert played President David Palmer on the hit TV series 24, which, let’s face it, is pretty much sci-fi. But to be honest, as I watched each of those portrayals, I considered: 1) how cool it was that the director had made the casting choice, just as I do every time I see a female president in a movie or TV show; and 2) how unlikely it was to ever come true. Call it outright cynicism. But frankly, the fearful behaviors and attitudes of many Americans since 9/11 has worn me down, to the point that I thought such a possibility was still decades away yet. And then last night had to go and happen. An electoral landslide. Go figure. Welcome to the future, my fellow Americans. It took you long enough.